Hit the wall big time at the end of March. The big move back to D101 HQ from our rented accommodation, was as nasty as me and my wife had predicted it would be. Lots and lots of boxing up, shifting boxes up and down stairs, cleaning, then some more cleaning, dealing with unfinished bits and glitches in the house, adding to which my Dad died after a brief but ugly battle with Lung Cancer. Conpulsion at Edinburgh University Teviot House over the Easter weekend really lifted my spirits. I’ll make a fuller report of this awesome weekend later, but it really invigorated me and put my head in a bright and happy space. The Company – literally preparing this one today, should be out tomorrow. The follow up adventure “Operation Camphor” should be out in the next month or so. Crypts and Things: The Blood of the Dragon – about to be proofed and remaining art commissioned. Here Be Dragons – in editorial with yours truly, for a summer release. The Worlds of Wordplay – which is the new name of the reissued, revitalised and resized Wordplay The Big 5 + The Drowned Lands. River of Heaven – John Ossoway’s D100 magnum opus. 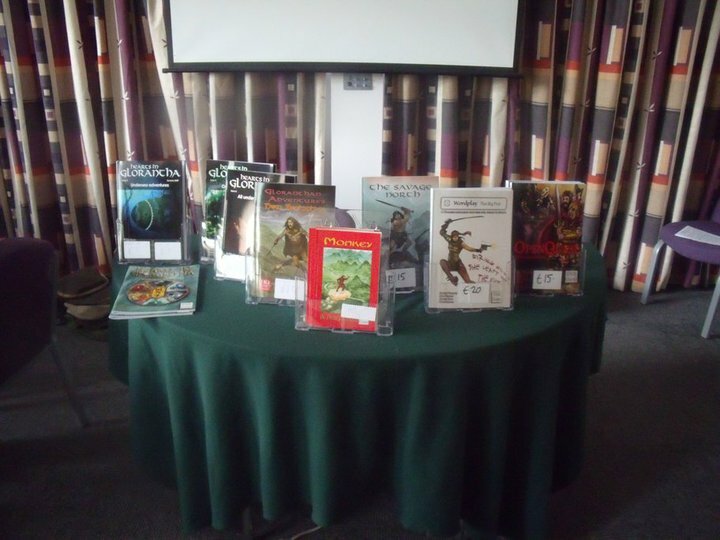 …and a whole bunch of stuff for Glorantha, since Continuum ( a traditional hot bed of UK Gloranthaphiles is upcoming ), including Hearts in Gloratha issue 5. Oh and not to mention a little thing called..OPENQUEST 2. As Real life hits me soundly round the head, with impending house extension, I’ve been consolidating here at D101. Moving Print versions over to DriveThruRpg.com. This is a slow process, first I have to do some tweaking to the files (Drive thru are a bit more demanding than Lulu), regenerate the cover (different format) and then patiently wait during the approval process that takes a week or so. Monkey and OpenQuest have been done, I’m awaiting proofs, and the rest of this month should see all the supplements and Gloranthan Magazines get done. It make sense to have all my print titles in one place, and Drive thru is a much much better deal for both you and me. This time next month I should be moved totally and will be closing down my Lulu store. OpenQuest for the win! I’ve more or less sorted the OQ release schedule for the next year. The powered by OQ games The Company & River of Heaven are the first priority. Look out for very special pre-orders soon 🙂 Then we are back on track with OQ Fantasy releases, which I’ll post more details when the fuss over RQ6 is over. Forum. The current forum is going to die and probably not be replaced. For a small outfit like me it doesn’t make sense for me to have my own forum. I check all the major rpg forums, and have a google alert set up so if you talk about one of my games I get an email about it, so over the next couple of days the forum will get closed. Been a while since I rambled on about the inner workings of D101 and what I was working on. I forgot how much it used to fire me up. So Furnace is coming up and its time to organise the D101 stall for the con, or not as the case may turn out. This year I’ve popped my cheery well and truly on the selling front, from two cons. 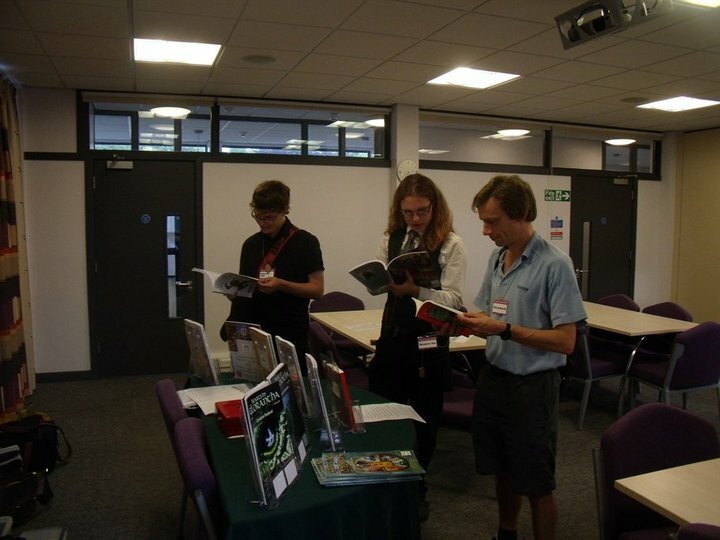 On the surface this looks like Dragonmeet in the Midlands, in fact it was originally going to be DM-Midlands. A one day con. There’s a mini-trade area where Mongoose and House Attitides were set up and then the main hall where trade stalls of various types not all rpg (we were in-between a CCG stall and a stall selling Pagan items) where there was also Leisure Games and a bring and buy stall. 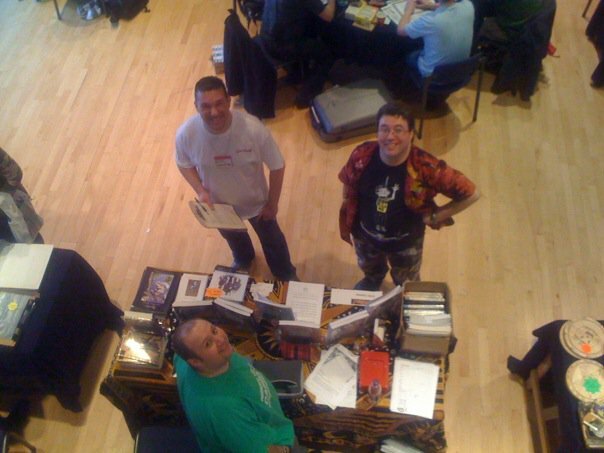 Here’s me Steve (behind the stall) and Gary “Evil Gaz” Bowerbank one of the organisers in a picture taken by Darran Sims (another of the organisers) from the balcony behind the stall. Short story here is that the gamers, despite the abundance of trade stalls, were there to game. Even Mongoose left early. I felt like a total lemon, while the D101 Demo team ran full games and had a grand time, I made two sales (fortunately enough to cover the cost of the stall) all day and went home will practically all the stock as a result. Very different set up here. Although Continuum has a similar foot fall (about 200), its a 2 day residential con. Learning from the mistakes made at ConQuest, I put the stall firmly in the room that we had for gaming, we had 2-3 tables on the go in all slots. I called the stall the ‘Magic Stall’ because it magically appeared in-between slots, and was ‘closed’ while I was running games. Initially the stock was packed up when it was closed, but by the end I left stuff out for people to browse. As you can see from the photo, the Magic stall is less of a barrier but more of an open feature. This worked great guns, contact with the customer was easily made. The only change I would make for next time would also to have a ‘breakfast’ Magic Stall that appeared at the edge of the Dining hall, after I had my breakfast (I’m an early riser). This is what Leisure games did on Saturday and they where doing great trade at 8:30-9 as people had just finished breakfast. Another thing I did was try out the man with games in his bag approach – Monkey you see fits in my man bag along with the cash box – and this worked very well since people know me well enough at Continuum to wander up and ask for a copy. This ease of access also led to sales of books that were upstairs on the Magic Stall in the Games Room as well. Because I had copies with me at all times as soon as someone asked me about the game I had something to show and sell. As a result I literally was selling Monkey up until the moment I left the con! So for Furnace I’ll definitely be repeating the Continuum set up of the Magic Stall and Man-with-a-game-in-his-bag , with some tweaks. First off OQ despite being based off the MRQ 1 SRD uses the OGL license to publish, not the MRQ Logo License (which is being pulled by Mongoose), so you are still FREE to use the OQ Dev Kit to base your game on (as long as you obey the OGL license that is included with it). When I talk about game I also include self-contained supplements. This has led to allot of people saying that OQ is now the only viable route for small press/indie publishing of D100, either that or contacting Chaosium and arranging a BRP license, and in recent days allot of nonsense and speculation has been talked about OpenQuest as a result. In this post I hope to put some of those myths firmly to bed. If you plan on using OQ as a base of your game because of some commercial nonsense of Brand awareness, think twice and then think twice again. OpenQuest is happy fun little community based game. If you are on board with that’s groovy and cool. Help build the community, visit the D101 forums tell us what you are doing, get involved in discussions and you’ll be hitting the right mark. OQ currently is a minnow of RPGs. Who knows with a bit of love and attention it will grow into a big Whale of a game, but for now its worth taking some time to ground your self in the small reality of the situation. Just because OQ gets mentioned on RPG forums now, doesn’t mean its a cash cow or even that people take it seriously. Think niche within a niche. This if fore-coming will be posted on the OpenQuest Companion. Don’t email me asking me for new rules from upcoming D101 OQ powered games for your own project, like some people have recently. River of Heaven, OQ Modern and anything else I have in the pipeline will almost certainly have no new Open Gaming Content. John Ossoway, who is using OQ to power his Hard Sci-fi game River of Heaven, told me recently that although he’s a huge BRP fan he’s using OQ because he geniuely likes what it brings to the gaming table. This is the attitude that you should have when using OQ, not that you are taking advantage of the OGL lisence to do a BRP alike game and avoid the hassle of dealling with Chaosium over a BRP license. Currently there’s at least three serious games being worked on that I know about, whose creators have contacted me. Some are public (like Clockwork and Chivlary) , the others are still in early stages of development so haven’t been announced publicly. They all share the following common features, which means they will be successfully completed and be viable games. They add to OpenQuest, they are not just taking the Dev Kit tweaking and changing bits here and there to make another Generic game. They are interesting games in their own right. So no generic OQ Space, OQ WW2 or boring GURPS like sourcebooks. Their creators are getting on with the hard donkey work. While having the full text of OQ gives you a big head start (like MRQ SRD for me) its not the end of the process and the creators that have contacted me show that they understood this. Ok so there’s been alot of harsh truths in the sections proceeding the above. Here’s the good news. I’m firmly commited to supporting OpenQuest, by keeping it in ‘print’ (you’ll always be able to get it via Lulu or similar future Print on Demand services) and available in low-cost pdf and free plain text version. Also OpenQuest will always be OPEN and free to use. I may shift my focus onto other games using other systems, but I’m commited to updating the OQ Companion and publishing supporting adventures (we currently have three in the pipeline with a possible forth) and I’m always happy to talk about the game on forums and answer questions via email (the exceptions being outlined above). So there you go there’s a few home truths about using OQ to develop your game/supplement. Go on and DO IT! I’ve very recently became a father again for the second time. Young Henry Brian Newport was born Sept 14th 2009 and is fit and able. Mother is recovering well and elder sister Evie adores her new sibling, although is kinda annoyed that we pay less attention to her at important moments! OpenQuest. Another minor errata is due, but being held up as my main pc is out of commission at the moment. Since this is the nerve centre of D101 where I do all my InDesign layout this is quite annoying. Hopefully resolved in the next week or two, since time to tinker with PCs is severely limited at the moment. Monkey. I know this is going to sound lame, but I keep waiting for my head to be in the right place to get this finished. Only one chapter to do – the difficult setting & npc chapter, then a quick revision before sending off to be edited all in one go. Good news is that all the art is in so when the edited text is here it can go straight into a simple 6″ x 9″ layout. Hoping to have done by the end of this year early next year latest. Gloranthan adventures 1: New Beginnings. Currently reading the new Sartar book (400 pages of Gloranthan goodness) to bring my old Sartite adventures into line with it and occasionally striping out the stats and references to old supplements that are no longer needed. The idea is to make this a lightweight companion to Sartar, in that it draws from that book but doesn’t rely on it too heavily, that provides a short mini-campaign for new players and games masters before the main Sartar campaign kicks off. The cover art is done and I’ve got one of the HiG regulars , Xavier Llobet, for the internals. Its all coming together nicely this one. The Road Less Travelled. D101’s first non-Gloranthan supplement. Its a Questworld for Generic Fantasy, using the setting and adventure from OpenQuest. I admit I stalled for a while on this one, because I didn’t want it to be a lightweight conversion of text that is effectively free and I wanted to make sure I had enough ideas to make it a proper HQ release of its own. I’m satisfied that I’ve done this now, and I’ve started work fleshing it out for a Dec release. …also another unannounced HQ project may see the light before the end of this year which is a lot shorter and much much different from all the fantasy stuff that’s been released/worked on so far. In stuff that’s been worked on by others, Nathan is beavering away on Empire’s Rising a four part adventure for OpenQuest and John Ossoway is chipping away at the Hard sci-fi epic that is River of Heaven. As well as the previously announced HeroQuest version, John is now going to be using OpenQuest for a D100 version 🙂 More about that soon.